The SmartPill Capsule Motility Procedure is an exciting advancement in gastrointestinal healthcare. The SmartPill Capsule collects pressure, pH and temperature data from your GI tract and wirelessly transmits that information to a data receiver worn on a belt or lanyard. This data is then downloaded to a computer, allowing your physician to analyze the information. With just one Capsule, your physician can obtain the information needed to better evaluate your condition. Do you experience gastrointestinal (GI) symptoms such as nausea, bloating, heartburn, or an early feeling of fullness when eating? These are often symptoms of a motility disorder, such as gastroparesis, a condition where your stomach does not empty properly. If you suffer from these or other unexplained GI symptoms, the SmartPill Capsule Motility Procedure may be right for you. The SmartPill GI Monitoring System is indicated for use in evaluating patients with suspected delayed gastric emptying (gastroparesis). The SmartPill GI Monitoring System measures pH, pressure and temperature throughout the gastrointestinal tract. These physiological measurements are used to determine gastric emptying time (GET), whole gut transit time (WGTT), and combined small-large bowel transit time (SLBTT). In addition, pressure contraction patterns from the antrum and duodenum are used to calculate motility indices. Delayed gastric emptying is implicated in such disorders as idiopathic and diabetic gastroparesis and functional non-ulcer dyspepsia. What are the benefits of the SmartPill Procedure? The SmartPill procedure is convenient for both the patient and physician. The test does not require a hospital visit and does not expose you to radiation. While the test is taking place you are free to go about your regular activities. How long will I be in the doctor's office for the SmartPill procedure? The SmartPill procedure is initiated at your doctor's office and requires an office visit of approximately 15-30 minutes. After ingestion of the SmartPill Capsule you are able to go about your normal daily activities. After ingestion, the SmartPill Capsule collects measurements of pressure, pH and temperature throughout the entire gastrointestinal tract. The SmartPill Data Receiver, which is worn on a belt clip or on a lanyard around the neck, captures and stores the test data collected by the Capsule. Is there any test preparation? The SmartPill procedure requires that you fast the night before the test. Your doctor may impose other restrictions as well, such as taking you off certain medications prior to the procedure. How long will it take to pass the SmartPill Capsule? The single use, disposable SmartPill Capsule is usually passed within a few days. What happens after I've passed the Capsule? 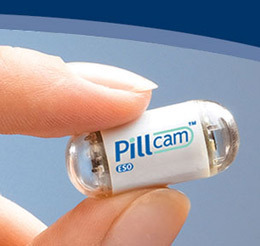 After passing the SmartPill Capsule, simply return the SmartPill Data Receiver to your doctor's office. Your doctor will download the test information to a computer and analyze the results. Please contact us for additional questions regarding SmartPill. My doctor saved me from a major colon surgery. His superior medical care and dedication made the difference and I got better with his medication and beat the infection. Thank you Dr Mohiuddin. He is a very nice doctor , very professional and caring. He has good demeanor. I highly recommend him. I love my Doctor at GNS. He saved my live by finding a tumor that could have taken my life. I owe you one doctor! !